In the summer of 2010, about a year after I became aware of my official status on the autism spectrum (though nearly 2 years after it was first suggested to me), I stumbled across a special needs parenting blog. I was hooked. I read it from beginning to current, and still follow it today. Then I followed their links and discovered the world of special needs blogging. Soon after, I discovered the blogs of autistic adults. I read everything. Voraciously. Absorbed everything I could possibly absorb. I started adding blogs to google reader when I realized I couldn’t continue to remember to check all 20+ blogs I was interested in manually. I began lurking and on occasion commenting. And then, in December of 2011, I finally decided to make the transition from lurker to blogger. I toyed with a number of different names for the blog. The original name was “suelement e”, which means “just e” in French. I actually even own the wordpress site for it, though nothing has ever been posted there. I have a confession to make, and that’s that I decided to make a blog before I had anything to write. So when I sat down to write my very first piece, the piece that became my namesake and identity online, it’s original title was “Seulement E: an introduction to a girl named E”. When I commented on blogs at all, I had used the identity of “E”, so it wasn’t completely new. And I decided that I liked being “E”. Then I started writing, and the glances just sort of materialized. Before I knew it, I had written something that was so uniquely me, that I knew, just knew, that I had inadvertently stumbled upon a perfect blog title, and identity for myself online: The Third Glance. I so rarely produce something that is so well written and thought out, that I was shocked that it came that easily. So I created another wordpress site, and I made myself a gmail account for the blog, and posted the essay, knowing that I was incredibly happy and proud of the first piece of writing I would put up. Then I sent the link to the one person in the blogosphere that I’d had email contact with, and she responded so positively, that I buoyed me and told me that I could actually do this. Then I did something crazy: I posted the essay on my personal facebook page as a note. I made it a private note that only those who were tagged could see, and I tagged some of the people in my life who I thought would either understand the note completely, and know that they were the people who had taken the third glance. I also tagged a few people who had made my early life in college hell, because they were actively taking the 2nd glance and trying to force those who had moved past that to revert. The people who bullied me, but who I have no contact with anymore, because I decided it wasn’t worth any effort, despite having mutual friends. And they, too, I like to think, stopped to at least think about what I had written. Some of them even commented, saying thank you. And I like to think I made a difference in those people’s lives, and the lives of those they interact with now. And only two of the people who I tagged (that I know of) have ever found this blog – both of them are wonderful people whom I respect and admire, and of the first category of people I tagged, not the second. Funny, since I called my note “The Third Glance” – any tiny little google search would have found me. And thus, a tiny autism blog was born, and “E (The Third Glance)” began to communicate to the world. The next day, I flew to my Aunt’s house (to meet the rest of my family), and spent a week there during “Christmas”. I continued to write, but nothing was coming close to that first post. So I decided I’d go to holiday theme, and thus my “An Autistic’s Holiday Survival Guide” posts were born. I wrote “Words” on the plane flight back home – my laptop didn’t have much battery, so I wrote the whole thing out on paper in a little notebook first, before typing it up. For someone with bad handwriting and difficulty writing, that was a feat in and of itself. And I had my second powerful post, and I thought to myself “I can do this”. So I did. I kept writing. Not a lot, for I’m not nearly as prolific as some other bloggers I admire. But I enjoyed it. And I produced a bunch of posts that people have really enjoyed and responded to. I also began to really meet and interact with other bloggers. I followed nearly 3 times more blogs in my google reader. I made many more connections. 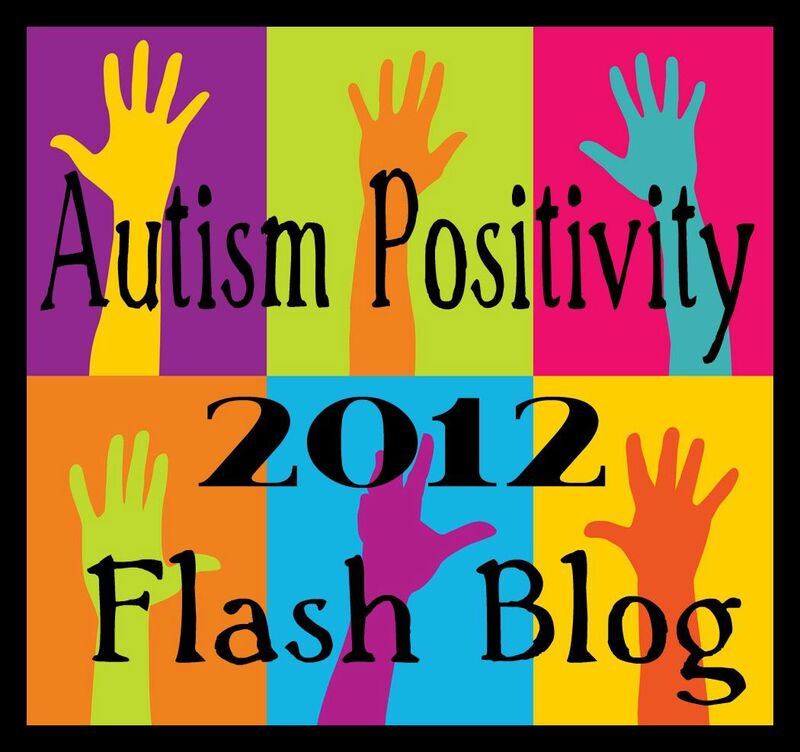 I even helped to conceive and run the Autism Positivity Flash Blog event this past April 30th, as webmaster, and also contributor. People were actually reading my blog. Not a lot of people, but more than 10, which was so amazing to me. People were interested in reading what I had to say? It’s an intensely amazing feeling, when I get a comment or a like or an email saying that someone has read and been touched by something I’ve written. I’ve met and collaborated with some incredibly inspiring people. I’ve learned an enormous amount about myself, because I’ve given thought to deconstructing my everyday actions, thoughts and feelings. I’ve become more confident in my autistic identity, and I’ve even gained more abilities to function – I can learn from my mistakes and my triumphs, but only if I recognize them first, after all. I’ve even, dare I actually say it, helped people to better understand themselves and their children. And that is the best thing I could possibly hope for. I know it sounds corny, but if my writing helps just one person reach clarity and understanding, and helps them to live a better life for themselves or their children or friends or acquaintances, then I feel like I’ve done something good. It’s been an amazing adventure, and I hope to continue it for a long time. When I started blogging, I didn’t know what direction I was going to take the blog. I didn’t have any goals or any message I wanted to spread. I just wanted to share myself, in uncensored honesty. I wanted to give people a chance to understand what goes on in my mind, because so little of it is actually communicated directly. Unlike many of the other autistic bloggers in my demographic (20’s, student or of that general age/a little older), I am not focused on rhetoric of social justice and disability rights. I didn’t have an agenda for self-advocacy or politics. (I’m not saying this is unimportant, just that for me, it is not at the front of my mind.) I didn’t want to prove anything or press anything on people. I just wanted an outlet. Today, as I sit here writing this 100th blog post, I can say that this hasn’t changed much. If anything, my goal is still to record how my brain works. It’s to shed light on why I do the things I do. Whether that applies to other people or not is secondary, though it is really amazing when something that “clicks” for me also “clicks” for someone else, and helps them to live a happier or better life. I have always been a “lead by example” kind of a person, and life my life by the so-called “Golden Rule” – treat others the way you want to be treated. So I suppose, my mission is to spread acceptance, tolerance, kindness, and happiness. I’ve written about this before, and I will continue to do so in the future. The world can always use a little more compassion. So, on this 100 Posts Day, as I pause and reflect on this blog, I would love to hear more about all of you, my wonderful readers. You are the reason I’m not writing into the giant void that is the Black Hole of the Internet. You are the reason I am able to help spread understanding of and compassion for autistic people. And ultimately, what I write means nothing to anyone else, unless it is read. So, I’m making a request. In honor of this 100th post, please leave a comment for me, telling me how and when you discovered this blog, why you read it, and if you have any connection with autism. You can post anonymously if you want (just make up a “name” and “email”) – the reason I picked wordpress over blogger has a lot to do with the comment system for people who wish to remain anonymous, but have an identity if you so chose. I would love to know more about you, my readers. For me, the most interesting, compelling thing about being a member of the blogosphere, is the personal stories that people share. I love to know about how other people think, reflect, and respond. It helps me understand how other humans work, and it also opens my eyes to all the other life experiences that people have. So please, lurkers and regular commenters alike, come on out and leave a comment. If you’ve only read one or two posts, or if gone through my entire archive, (or anywhere in between), I’d love to hear from you. If you don’t want to leave a comment, please consider sending me an email. And thank you, all of you, for taking that Third Glance, and sharing this great adventure with me. It’s only the beginning. p.s. I have linked to a number of posts in this post, however they are by no means all my favorites or even many of them – please, if you haven’t already, go check out my “posts I’m most proud of” page – I’ve listed some more “highlights” there, and while it’s not updated all the time, I try to update it every few months. 🙂 Though if you just read two other things while you’re here, The Third Glance and Words are my recommendations. I think I found it with the babble autism blogs thing, since I checked out most of the ones there that were written by autistic people. That or from another blog I read, in which case the trail probably begins at Autistic Hoya. I believe I started following you after I saw a link to your blog posted by A Thinking Person’s Guide to Autism, which I follow on Facebook. My 11 year old son was diagnosed with autism officially at the age of 5, but I knew for about three years. I couldn’t find a professional that would evaluate him properly or felt qualified to make the designation. At any rate, I enjoy reading your posts because it gives me insight into his thoughts perhaps. While my son is verbal, he still says and does things that confound me. My dreams for him are that he will go to college and pursue whatever academic path delights him. You are a living example that my dreams aren’t unrealistic. Congratulations on your 100th post. Keep them coming. I love to read them. I found you after you interacted with my blog. I immediately was taken by the voice of such an old soul — within such a young person. You have a lot of heart, E. And a lot of wisdom to share with anyone affected by autism. Congrats! I found you via twitter (I think) and I’m so glad! I’ve only been reading your blog for about a month but I’ve already learned a great deal in that short time and really value your honest, thoughtful approach. Congratulations on your 100th post! What a wonderful milestone. 🙂 Thanks! I believe I found you through twitter too. Congrats, E! I believe the very first blog posting of yours that I read was, “Words”. Found you through Flappiness Is, (another one of my favorites who just rants and raves about you!) I was amazed how you described the way you heard the words and how they just didn’t make proper sense put together. It made sense to me because my 5 year old son, Evan was diagnosed on the spectrum and I have always had a gut instinct that he heard and interpreted things much the same as you. The spectrum is so broad and I’m sure everyone is different, but isn’t it astonishing that so many identify with you? Are we all really that different? The more I learn about people on the spectrum, the more I learn about my perfect child, the more I crave their company as opposed to the neuro typical ones. Especially in young kids.. I’m biased, of course, but my child doesn’t seem to possess the mean behaviors, the manipulation, the spitefulness that the other “normal” kids just display so naturally. My other child is 9, Evelyn.. (I love E names as well!) Has tourettes and deals with an array of body, facial and vocal tics that will subject her to looks and stares once she hits adolescence, so my journey as a supportive parent is going to be rough. I’m thankful, however to be able to read your thoughts and feelings, E…. Because I am left with a very positive and hopeful feeling about what things lay ahead for both of my children. You are an inspiration, whether you choose to think so or not. I will continue to follow you and wish you the best of luck in your further success! O, E, I never know how to tell you just how completely I adore you without embarrassing the heck out of you, so i just hope you do know. Even if I didn’t care a bit about autism, your kind and generous spirit and your love of knowledge are just so wonderful to be around, truly. I am so pleased to say, I followed your blog from day one, literally. I caught it the first day you published via the autism wordpress tags. (I was the first commenter) I loved your first piece and though I am not always a big commenter, I remember thinking I hoped you would not be one of those blogs that only has an entry or two and moves on because I really wanted to hear more, so I left the comment in hopes of encouragement. So, congrats on 100 and here’s to a googolplex more! Congratulations with the 100th post! This post is a great idea. You already know that I found you blog when it was just a month old via the ‘Versatile Blogger Award’ awarded from Nominatissima, and I could see its quality straight away. I read it because it is insightful in a personal, unique way, well written, well structured and consistent. I have spectrum-like challenges (but far from all the ones you write about) and reading yours and some other ‘aspie blogs’ helps me to compare to & view my own challenges from new perspectives and learn about others’ life strategies. You seem to manage your life really well. I’m confident that your successful study/professional strategies (‘being paid to persevere’… excellent!) are leading into a great future. That is inspiring. Hi E! I found you from Flappiness Is, and fairly recently too. Congrats on your 100th post! My 10-year-old son has an Aspergers diagnosis, and the world is a lot less difficult for him to navigate than it used to be. Thanks for doing what you do, and letting me come along for the ride. Hi E, I know I found your blog through another blog but I can’t remember which one now. My 8 year old son has aspergers as does one of my brothers. He is wonderfully sweet and kind andlves everything to do with numbers. Keep up the good work with your blog. I always smile when I see a new post in my inbox. Thanks Spymummy 🙂 Nice to “meet” you, and thank you so much for reading and leaving this comment! Hi E! Congratulations on your 100th post. I am a mother of autistic boy (12 years old) and I live in Indonesia. I found your blog when Arianezurcher suggested to read your blog to understand autistic person better. I subscribe your blog, and always read your posts since then. I plan to read the archive too. I am grateful to you, and looking forward to read all of your posts. Your posts open new perspectives and bring new understanding and inspirations to me. Thank you and keep posting. Congratulations on your 100th post! I discovered your blog at the start of the year and have been following it ever since. My connections with autism are having a friend and a cousin on the spectrum. As a PhD student, I enjoy reading about your experiences in academia and because my research area is autism in adulthood I also appreciate your perspective about what it’s like to have autism and how you see the world. My research and PhD aside, I just find your blog an enjoyable and interesting read. Thanks for creating this blog. Hi Honourable Mentions! Thanks for the comment 🙂 It’s really neat that you’re studying autism in adulthood. 🙂 PhD student-hood is fun, isn’t it? I love your blog E. I feel so much less alone reading your posts and how you see things, how you react, etc. The world is a scary place when you feel alone. Amidst all the confusion and the gray areas, I find some solid comfort by your posts. I’m not alone, and neither are you, or many others. It’s comforting. Keep writing and I’ll be trying to do the same for myself. 🙂 I only wish I were as articulate as you. Hi! I recently discovered your beautifully written blog during my journey to self-discovery. I’m an adult in the process of being diagnosed with autism. Your background reminds me of my own, although I never completed my PhD program. Things fell apart before I could finish it, but things would probably have fallen apart anyway, degree or not. 7 years later, after living most of my 30’s jobless, alone and isolated, I found out what I am. Did a lot of research, read a lot of blogs. Found insight. Found a lot of miserable stories like my own, but also a lot of hope. Your blog gave me both insight and hope. Thank you! I believe I discovered you through Bruce @ Born 2b me back in December 2011. I have a son who is autistic and I start my diagnostic process next week to confirm me as well. Your blog has helped me in many ways by giving me words to things I did not understand about myself. It has also helped me with my son. I relate to many things you have shared and your words have given me confidence in accepting myself as well. Thank you for all you have shared and I look forward to continue reading more! Congratulations on your 100th post! It was on Twitter that I first discovered you and was privileged to witness the beginning of your blog when you announced it on Twitter. Here’s to the next 100! I am looking forward to learning more from you. You and so many others like you are paving the way for my son. Thank you!! Hi, I don’t remember how I found you in the Blogophere, but you write incredible posts. Thank you for opening this chapter and making me understand. I have no personal connection to autism, but I look forward to learning more. Congratulation on your 100th post. And I loved the recent one about buying coffee for a friend. I’ve been reading for about six months, having followed some link from some other autism-related blog somewhere. I don’t remember where. I read a lot about autism, and click on a lot of links, and they start leading to each other after awhile. Autism has been a special interest of mine for decades and I’d self-IDed for years. But I found it around the time of my own finally official diagnosis, at age 35, and your specific “The Third Glance” post was probably the closest thing to my own experience I have read. I pass, except that I don’t. I brought up your explanation to the psychologist diagnosing me, actually. In addition to being an autistic adult, I’m a pediatrician training to care for kids with developmental disabilities, including autism. Actually I have a huge favor to ask. I was wondering if I could quote from some of your recent descriptions of how you percieve (or don’t percieve) pain. I’m putting together a presentation about taking care of kids on the autism spectrum for a group of pediatricians and future pediatricians, and I want to quote actual autistics as much as possible. I’ll credit you by name, blog name, E, whatever you want. The psychologist responded positively. She’s also a colleague and I know her well enough to feel comfortable bringing things up that aren’t traditionally part of the way professionals discuss autism. I’ll be sure to specify I’m sharing one person’s particular experience. When I speak about autism or disability, I use a lot of phrases such as “many people feel. . . ” or “your patient may prefer. . .” to avoid trading their existing stereotypes for new ones. But I’d still rather share a first person description and point out that experience of pain or injury may be different than expected. I can’t use my own experience because, as far as I can tell, my pain experience is pretty typical. I do have problems using a 10 point pain scale, probably related to autistc litereralism and inability to imagine “the worst pain imaginable.” I can compare pain to other pain, but not to a numeric scale. People have a lot of trouble with the idea of a doctor who can’t use a simple thing like a pain scale, and the one with pictures doesn’t help. Another part of passing but not passing, I suppose. That’s neat 🙂 I’ve always wondered what professionals would say to me… since I was diagnosed much younger, and haven’t bothered to get re-assessed (I’m terrified of (visiting) doctors/medical professionals, actually), and at the moment, a re-diagnosis wouldn’t change anything, so why bother spending that time/money, etc. 10 point scale of pain is just confusing. Mind, I can’t figure it out for the life of me. And since my body hates me, I’ve experienced 9’s on a (mostly) monthly basis since I was 16… curled up on the floor trying not to pass out or vomit, quite often completely immobile and unable to function. I’m pretty sure that’s not a 10, but I can’t imagine anything worse than that… Besides, I think everyone experiences pain differently… what might be a “6” for you, could be a 3 for me, or vice versa. Congratulations on your 100th post and on achieving so much within a short period of starting a blog! It’s no small achievement. I’m a first-time visitor and commenter and have thoroughly enjoyed what I read today – I will be back to read more. As to how I found you…I actually think that you found me, to start. I remember seeing your name as a commenter on a Huffington Post article on which I commented, and got a notice soon afterward that you’d become one of my “fans” (“Really?” I thought. “Wow!”) I think that must have made you one of my Twitter followers. I recognized your name and gladly followed you, and tonight I saw that you’d posted this and thought I’d come check it out. Welcome 🙂 Glad to have you stop by! I have definitely seen you around. I think I’m a twitter follower of yours, but I don’t recall ever becoming a HuffingtonPost fan of anyone… perhaps it did it the other way? Anyway, thanks so much for popping by! I realize while I’ve seen you “around”, I haven’t yet followed your blog – going to fix that problem right now. (Though I have read some, and definitely loved what I read, it just didn’t, for some reason, make it into my google reader. Thank YOU, executive dysfunction) Welcome! What a coincidence- I learned of my diagnosis around the same time as you, too!